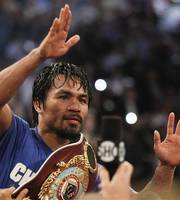 LAS VEGAS (AP)—Manny Pacquiao won a lopsided 12-round decision over Sugar Shane Mosley on Saturday night, retaining his WBO welterweight title with his 14th consecutive victory. Pacquiao (54-3-2) didn’t get the knockout he wanted, but the Filipino Congressman retained his position the most dominant and exciting fighter in the sport, methodically beating Mosley (46-7-1) at the MGM Grand Garden in Las Vegas. Pacquiao knocked Mosley down with a left hook in the third round, a punch that seemed to sap Mosley’s willingness to engage. Pacquiao ran after Mosley the rest of the fight, but the former champion who has never been stopped in 18 years in the ring managed to finish the 12th round on his feet.